﻿﻿﻿"From the time you arrive you feel like one of the family. Rosie and pirate are very welcoming and the rooms are beautiful. Having drinks and nibbles on the veranda in the afternoon is lovely. Rosie cooks a huge breakfast and for a little more will do a great dinner too. Would highly recommend for a quiet relaxing stay." "Words cannot describe this incredible place. As soon as you walk through the gates you feel at ease. Superb hospitality and gardens to delight. Now we have discovered this gem we are already planning our trip back. A short drive from the Sunshine Coast and easy to locate. Thanks so much!!!" "We couldn't have received a friendlier welcome. Rosie came straight out to meet us, showed us around then treated us to welcome drinks on the veranda. She shared some of the wonderful history of the house, which exudes enormous character and charm. Rosie ensured we were thoroughly looked after, preparing a delicious breakfast of fresh fruit, bacon, eggs and home-made caramelised onions the following morning." "Had a wonderful weekend away in the country with close friends at Kilkivan Country bed & breakfast. Rosie was a fantastic host, cooking us delicious meals for dinner & breakfast & sharing a glass or two of red with us.The homestead is so welcoming with it's high pressed metal ceilings & intricate details & the old fashioned fireplace was the place to be on a cold winters night. Comfy beds, beautiful rooms filled with antique furniture. You can also sit & watch the sunset around the campfire then watch the abundance of stars fill the sky. Will definitely be going back! Thank you so much Rosie." "Rosie was out to greet us as soon as we arrived and her 5 star service continued until she and Pirate (her Beautiful dog) waved us goodbye out the gate. We were given exceptional treatment and appreciated her beautiful home that she let us share with her. Nothing was a problem and the food, the room and all facilities were great. We will go travelling in the area throughout the year and we will be going back as often as we can as it feels like home. If anyone is looking for a relaxing weekend you will enjoy it here and there are several wineries and other attractions in the area. A lot of 5 star hotels could learn a lot by staying at Rosie's . Thanks for letting us stay and look forward to seeing you again." "What a wonderful place to stay! The house is beautiful, a fantastic old Queenslander. The host is delightful - friendly, warm, great company but totally professional. Besides that, a great cook and very considerate of people's feelings, needs and comfort. We will definitely stay there again when in the area." "The location is absolutely superb, the house is so beautiful and the host amazing!! I cannot wait to return and relax some more in beautiful Kilkivan, and spend some more time with Pirate, Feisty and Nugget!" "Rosie is the owner and our host and she made our stay at this beautiful historic home a perfect getaway. We chose the room with the ensuite, it was very large, with wonderful high ceilings and a divinely comfortable bed. The bathroom was not just an ensuite but full size with every amenity necessary. Rosie cooked us dinner and a hot breakfast which were both delicious. This is one of the loveliest B & Bs we have stayed at, we can't wait to return." 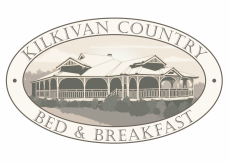 "I thoroughly enjoyed my weekend stay at Kilkivan Country Bed & Breakfast! The home cooked meals made by the owner, Rosie, were absolutely delicious and it was wonderful to sit by the campfire at night (or fireplace inside) and relax with a bottle or two of wine. As a city girl, it was fabulous to get a real taste of the country life with the friendly Dalmatian dog on site and the property's two horses. The B&B is newly renovated so has all the modern-day facilities you could ask for and was exceptionally clean. I highly recommend treating yourself to a relaxing weekend away - where you definitely won't need to even flick on the TV for entertainment! It's only about a 20 minute drive to the South Burnett's acclaimed wine country and if you ask nicely Rosie might even take you up to her Dad's famous gazebo on their cattle farm which has a stunning view of the entire region. We'll be returning again soon!"